Did you know that April is not only Tax month but ironically also National Financial Literacy Month? How many of us love paying our bills or are good at budgeting?! Unfortunately, not all of us can be bankers or accountants. As you read more you will see how MonarchCare has helped many with this task, not only those who are vulnerable but some who are overwhelmed with financial tasks and even those who just hate to do it! We also want to thank all of our volunteers this month during National Volunteer Appreciation month. To celebrate, we are kicking off our Board Member of the Month segment in this issue, recognizing all the hard work our small board of Directors does voluntarily for MonarchCare. There are many reasons why some individuals and families have difficulty managing their personal monetary affairs. They may never have learned money management skills, don’t like dealing with financial matters, or health-related conditions may make it difficult to write checks. Other challenges include developmental disabilities, shopping or gambling addictions. Our Financial Specialists have comprehensive experience in assisting individuals and families with budgeting, opening bank accounts and applying for public benefits. Some of our clients need only counseling and technical training in managing their finances themselves, as in the case of the new widow whose husband always managed the household finances. But others may need to safeguard their income (VA and Social Security benefits) because of personal challenges such as mental illness or substance abuse. In these cases MonarchCare can serve as the “Representative Payee” to receive the income, pay obligations and distribute cash to the individual in safe and appropriate increments. Mildred is a wonderful example of these services. She is 86 years young, lives alone in Tamarac and came to us through our partnership with the City of Tamarac to assist their residents with these needs. Mildred was low on food because her expenses were high. We applied for food stamps and the Medicare savers program, allowing her to have more food and save on her Medicare Part B expenses. We are proud of the work our staff does, both with direct clients and in our community outreach projects, assisting as many of our friends and neighbours as possible to successfully manage their finances. Please visit MonarchCare's website for a detailed description of our Financial and Entitlements Services. Do you have a client, friend or family member that could use a little help? By referring them to us you help in many ways. We can work with them to get their finances on track using a sliding scale fee based on their ability to pay. These fees enable us to help those who cannot pay anything. If you are interested in partnering with MonarchCare to help your friends, family or clients, please contact us. WITH YOUR SUPPORT, YOU HELPED US TO PROVIDE 147 HOURS OF PRO BONO SERVICE IN MARCH. As a first step to long-term, financial health, you should take stock. Be honest with yourself when you do so. Think about the choices you have made in the past and the choices you would like to make in the future. If you have difficulty denying yourself something you want, the newest I-gadget or the expensive shoes, try to find a way to avoid temptation. That might mean giving up the credit cards or getting rid of your ATM card. However, if you are responsible with credit but have encountered setbacks due to unemployment or health problems, you need to work out a “bounce back” strategy. Visit the website of the National Foundation for Credit Counseling for helpful information and tools to manage your finances. April 16th is the 6th annual National Healthcare Decisions Day. This recognition exists to inspire, educate and empower the public and providers about the importance of advance care planning. Oftentimes MonarchCare is appointed a person’s legal guardian simply because they never made this type of decision. National Healthcare Decisions Day is an initiative to encourage individuals to express their wishes regarding healthcare, and for providers and facilities to respect those wishes, whatever they may be. Check the website of National Healthcare Decisions Day to see a wealth of information on the subject of final wishes. Providing our service is all about partnerships - we cannot do it alone. 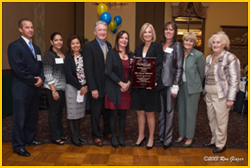 If you missed our March Transforming Lives Luncheon here is a peek of what you missed. CEO and Founder Knyvett Lee is flanked by the City of Tamarac’s Mayor and members of the City Commission and Social Services Department, one of the honorees at our event and a partner with MonarchCare in providing services to Tamarac residents. April is Volunteer Appreciation month and one of our best volunteers is the President of our Board of Directors, Elizabeth Davis. Elizabeth has served our organization for 7 years. Currently she works for Aetna as the Vice President of Sales - Group Retiree, for the Middle America & West Regions. A Florida native and married with three children, she has more than 20 years of experience in health care sales and account management. In addition, Elizabeth previously worked for Evercare, a business segment within UnitedHealth Group. There she managed the statewide sales of Evercare at Home and Evercare Health and Home Connections, two Medicaid Waiver programs which focus on bringing community-based solutions to the frail elderly and disabled. Elizabeth's passion for serving came from her many years managing and promoting Adult Day Health Services throughout Florida. In fact, Elizabeth served as President of the Florida Adult Day Care Association from 2002 to 2004. She maintains her connection to at-risk members of our community by remaining an active member of the MonarchCare Board. She works diligently with all our Board members to help educate the community on our services, while also fundraising for us. You can help by bailing her out of jail in July for our “Jail and Bail”. 1. Cook green beans in salted water until “al dente” and still bright green. 2. Drain the beans and put them in an ice water bath to stop the cooking and maintain the vibrant color– once cold, dry the beans on a cloth towel until just damp. 3.Whisk shallots, mustard, vinegar, oil, salt and pepper in a large bowl until well mixed. 4. Add beans and cheese to the vinaigrette and toss well. 5. Refrigerate for at least 30 minutes, toss again before serving. 71.2 calories, 4.8 g fat (56.7% calories from fat,) 3.3 g protein, 4.9 g Carbohydrate. Christy Lambertus, Esq. – Lambertus and Lambertus, P.A. Larry Levy, Esq. – Law Office of Lawrence Levy. P.A. Scott Solkoff - Solkoff Legal, P.A.